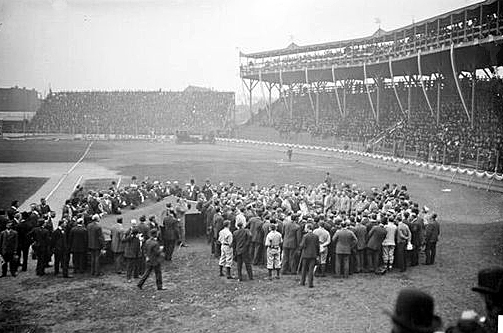 May 14, 1907 – At 2:40 p.m. Chicago White Sox officials begin the festivities that honor the team for the victory in six games of the “Hitless Wonder” in the 1906 World Series against cross-town rivals, the Chicago Cubs. “For ten minutes,” the Chicago Daily Tribune reports, “a stream of autos charged intermittently through the gate and deposited city and baseball officials, ball players, and rooters all over the outfield.” [Chicago Daily Tribune, May 15, 1907] Mayor Fred Busse, Police Commissioner George Shippy, and Charles Comiskey unfurl the World Series pennant and carry it to home plate where William Hale Thompson asks for and receives “three cheers for Comiskey, three more for the White Sox, and still another three for the mayor.” As the ovation continues, a “mounted delegation” from the stockyards gallops “into the field and rode pell mell around it to the accompaniment of vigorous applause.” Then, the president of the National Baseball Commission, August Hermann, presents the award to the mayor and Comiskey. Silence fills the stadium as “the ropes were being fastened by expert hands to the pennant. The white stockinged players, who had fought for and won that emblem of supremacy, grasped the hoisting rope, forming themselves into a long line with Manager Jones in the place of honor, and began to haul away.” And then … “Just as 15,000 throats were swelling with the first notes of the grand paean which was to have marked the climax of Chicago’s biggest baseball féte, just as the silken banner, emblematic of the highest honors of the diamond, had shaken out its folds over the White Sox park and started its upward climb in response to the tugs of the heroes of the day, Comiskey’s veteran flagstaff swayed, trembled in every fiber, then broke squarely off in the middle and toppled back to the earth which reared it.” The pennant is temporarily draped over a liquor sign in right center field as the game begins in threatening weather and is quickly called as the field is “flooded beyond all possibility of further play” within five minutes. Several cars have to be pulled out of the mud in the outfield with the last one pulled off the field just before dark by a team of horses. “The pennant will be raised another day,” the paper concludes, “when President Comiskey is able to have erected a new pole strong enough to bear the strain. But there will be no heroics. Chicago had those yesterday.” The presentation of the pennant at home plate is shown above. 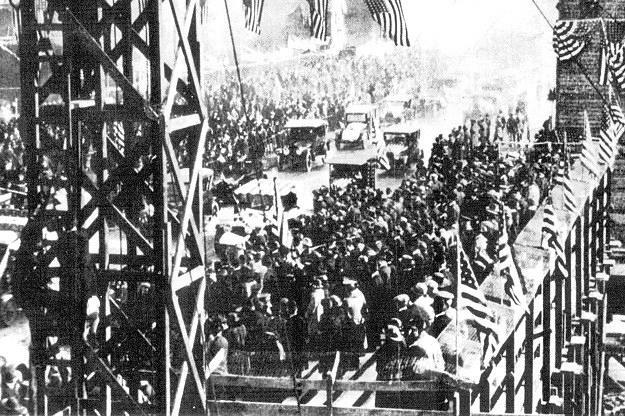 May 14, 1920 – The Michigan Avenue bridge is opened to traffic. It took 24 years and four city mayors to get the project completed, a project that began, according to Mayor William Hale Thompson, with a suggestion from the wife of the city controller in 1891, Mrs. Horatio N. May, who thought it might be just swell to have a link across the river at Michigan Avenue. Twenty years later the first plans for the bridge were drawn up, and in 1913 the first ordinance pertaining to the construction of the bridge was passed. Condemnation proceedings, authorization of bonds to finance the project, and the federal government’s objection to the use of steel for the bridge during wartime kept construction from beginning until April 15, 1918. Finally, at 4 p.m. on this day Mayor Thompson leads a motorcade from Congress Plaza up Michigan Avenue to the new bridge, where he cuts the ceremonial ribbon. Airplanes appear above and drop confetti. Four thousand cars follow the mayor’s automobile across the new bridge. A tiny dirt road on the north side of the river called Pine Street is now poised to become one of the city’s most impressive thoroughfares.